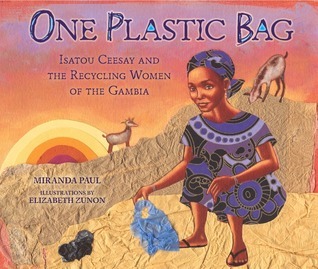 This is a true story of one woman who began a recycling campaign in her hometown of Gambia. Isatou Ceesay noticed how the plastic bags that floated in the air ended up in garbage heaps along the roadside collecting dirty water, leftover food, and mosquitos. Her grandmother’s goats, and other goats in the village, were getting sick and dying because they came to the garage piles foraging for scraps and swallowed the plastic bags which got caught in their stomachs. Isatou and some of her friends decided to do something about the problem. They washed out the bags, hung them to dry, and cut them into strips. Then they used the strips of plastic to crochet purses which they sold in the marketplace. With the money she earned, Isatou was able to buy her grandmother a new goat. But more importantly, she taught the people of her village how to recycle and care for their homes and land. Looking for fun and easy ways to recycle old plastic bags? I found these pretty quickly. I’m sure you can find many more in just a few minutes.